From August until October or so I had the opportunity to fish with a guy named Brad form out of state. He was born and raised and Colorado, but came down here for a few months to compete for a spot to be an AC-130 pilot which was pretty cool if you ask me. While he was down here he was looking for someone to show him the ropes and help put him on some fish. Austin ran into him first at Jerry B’s but soon put me in contact with him. While he was down here we caught quite a few reds and some black drum as well. On one of our trips we went into the Lighthouse Lakes and got on quite a few reds, they were every where and doing what I like to call crawling. Crawling is when the water is just shallow enough for them to not swim great so they use their pectoral fins to drag them a long the bottom, it looks as if they were crawling when you see them coming your way. This type of redfishing is easy because all you have to do is throw a small surface fly, #4 gurglers or VIPs, 1′ in front of them and start popping it. They won’t always take immediately, but if they don’t it makes for an exciting take. They’ll follow it for 20′ sometimes and you can see the wake the entire time, right when they are fixing to eat they’ll lift their heads out of the water and crush your fly from above. The reason they do this is because their mouths are on bottom and to eat something on the surface they have too. Austin, Adam and I ran out to Port A South and it was the same situation, stained water with sections of green water trying to sneak closer to the jetty later in the evening. 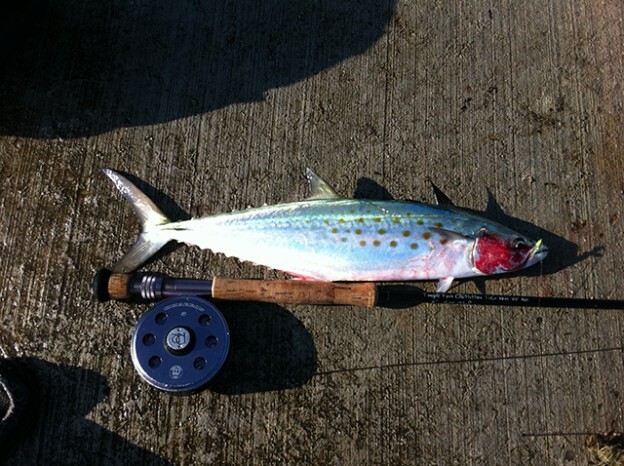 When we first showed up there were groups of smacks and ladyfish working glass minnows pretty hard. I cast to them and picked up a few ladyfish, but no smacks. There wasn’t much else going on other than that. Austin picked up a 20″ smack and I was starting to give up on the fishing at this point. I sit on Cranes Rock and just stare at the water hoping for tarpon or kingfish skyrocketing. As the sun began to hit the horizon I am really losing faith in the fishing, then I see a king skyrocket a few hundred yards off the jetty. I re-tie all my knots and start fishing. After a few casts, the fishing hasn’t changed much but there isn’t very much light left so I stick it out and keep casting. Finally my line goes tight and I see a tarpon go airborne. At this point I still just feel pressure in my line but can’t feel the fish. I think I might be caught up on Jeremy’s line and that he has the fish hooked and my line is tangled with his. Jeremy continues to reel in and finally catch up with the fish and he realizes I am hooked up instead. 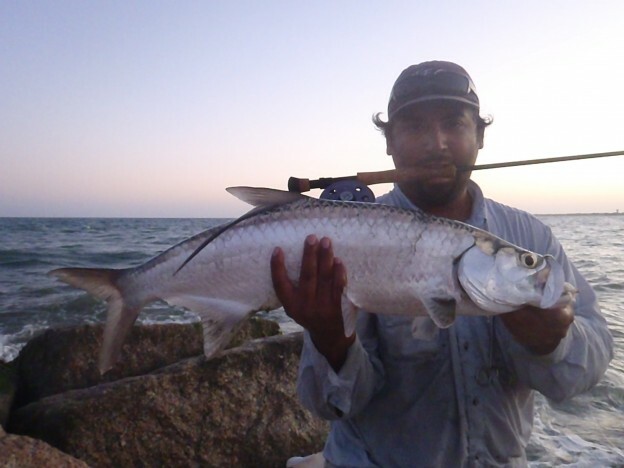 The fight didn’t last long but was much more aggressive compared to my previous tarpon. This one went on a few good 20’+ runs and wasn’t as aerial. My assessment of this fishing trip confirms my thoughts on tarpon: they do whatever they please. 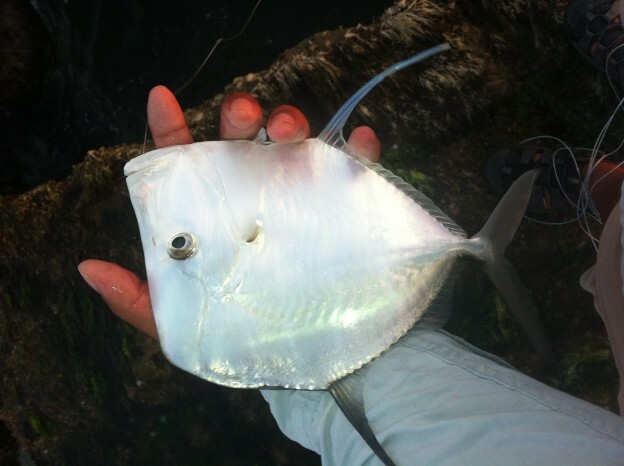 They don’t adhere to tide patterns or water clarity, if they want to feed they will do it. We also only saw one tarpon roll and it was 200 yards off the jetty. The only tip I can give when trying to catch a tarpon is keep casting, and try to keep a fly in the water at all times.